Leslie's Guiding History Site - Commissioners, Advisers. Whenever an organisation grows to any size at all, it needs a structure, and Guiding was no exception. Although Guiding sprang up in many areas almost overnight, with Patrols forming, and joining together to become units under pioneer Leaders, some capable and inspirational, some less so, soon there needed to be a structure to bring units into the organisation, to interpret, implement and enforce the guidelines which were being trickling out from headquarters, and to support the Guiders who were doing the pioneering work. The 1912 handbook certainly helped in laying down some clear guidance on how things should be arranged, as did the publication of the first editions of 'organisation, policy and rules', and the columns of the "Girl Guides Gazette" and "The Guider". Initially, individual units operated in isolation, but with the growth in Guiding came the need for a more formal structured organisation, and it was in 1915 that CHQ was re-organised, and the first County Commissioners were appointed - by 1920 every County had it's own County Commissioner. Lady Baden-Powell had a lot of influence in this, often writing to friends to urge them to become County Commissioners or Local Association members in their local Guiding County. In January 1917 the structure was a Chief Commissioner, and County Commissioners, each managing a team of District Commissioners, each of whom had a number of Assistant District Commissioners. By February 1917 the District Commissioners were to be Division Commissioners, and the Assistant District Commissioners became District Commissioners! So a structure was established with County Commissioners who reported to the National Commissioners for England, Ireland, Scotland and Wales. It was in 1971 that the Regions were introduced in England, to replace the Country structure in Engliand with more manageable-sized areas. In addition, there were Commissioners for Guiding in other Countries and territories which were part of the UK Girl Guides Association. Commissioners were, and are, the 'regional managers' of Guiding. As the book 'Notes for Commissioners' put it, "A Guide Commissioner is the representative of the Girl Guides Association in her area, and she works under the Commissioner next above her. She is responsible for the well-being of the companies and packs in her area, and she is an essential link in the organization of Guiding." So their job is to help and support the Leaders, to maintain 'good Guiding' in their area and, where necessary, to deal with problems which arise. They are also responsible for the reputation of Guiding in the community within their patch. Although it took time to fill all the vacancies in all the locations, within a couple of years of Guiding starting, there was a clear, hierarchical structure of Commissioners covering most of the Country. The County Commissioner is appointed by the Country/Region Commissioner and is responsible for Guiding in her area. in 'Notes for Commissioners' it is suggested "The County Commissioner should be an effective centrepiece in that it will be her part to appear on public occasions, to address meetings, to walk down guards of honour and to take salutes at parades, but that is not all; ultimately all the knotty problems that arise will come to her, she must be able to tackle difficulties, to advise wisely, and to deal tactfully and firmly with people and problems." There may be fewer guards of honour or saluting parades nowadays, but the public face and the tackling difficulties part is still ever-relevant! Then as now, she also needs to have a handle on how Guiding is run in the County, and to manage it - this also involves liasing with outside organisations, particularly local council youth and education departments, but also with other youth organisations and similar bodies. In the early years, County Commissioners wore Gold and Silver Cords around the left shoulder and pinned to the left lapel with a silver Promise badge, a navy uniform suit with white blouse and navy tie, and a silver cockade and silver cords on the hat. Later, a special diamond-shaped badge with a gold surround was introduced. In the early years, the big role for Commissioners was to get Guiding established in their area. Many Commissioners put in a lot of work and generated a great deal of correspondence (in those days when home telephones were rare) in finding suitable people to be Guiders, in persuading local dignitaries and people of influence that a Guide unit would be a positive thing for the youth of the area, in helping the Leaders with support and to get the training needed, and in visiting (often scattered) units in their area. She is appointed by the County Commissioner and has a dual role - to support the County Commissioner as one of her deputies, and to take charge of and support the District Commissioners who work under her. What sort of role this is will depend on the geography - whether she is dealing with a number of small towns in a compact area, or a large and sprawling area of countryside, or a mixture of the two. In the early years, Division Commissioners wore Silver Cords around the left shoulder and pinned to the left lapel with a silver Promise badge, a navy uniform suit with white blouse and navy tie, and a silver cockade but no hat cords. Later a special diamond-shaped badge with a white surround was introduced. She is appointed by the County Commissioner, after discussion with the Division Commissioner. As the 'local manager' she is immediately in charge of all the Leaders in her area, and can offer them help and support, and the opportunities they need to get training and development. She will visit the units occasionally in order to see for herself that they are progressing happily, and will hold regular District Meetings, to communicate information with the units and encourage them to communicate with each other. 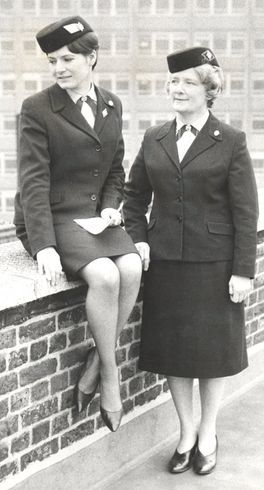 In the early years, District Commissioners wore saxe blue cords around the left shoulder and pinned to the left lapel with a silver Promise badge, a navy uniform suit with white blouse and saxe blue tie, and a saxe blue cockade and hat cords. Post-1968, Commissioners wore plain navy ties with the silver Promise Badge, and also a diamond-shaped Commissioner badge with a saxe-blue edge, as shown below. Although normally such appointments were only made at County level (or above) it was possible for Districts or Divisions to appoint a President in the past. According to 'Notes for Commissioners' "These are usually well-known people who by sponsoring the Guide Movement in their area give assurance to parents and public that it is a reputable movement." Uniform was optional for Presidents (since many were not members), their distinguishing marks were a coloured sash and a silver trefoil. Later sashes were done away with, and a special badge produced with a Guide badge, and the word 'President'. Just a glance at the first handbook will give an idea of the wide range of topics it covers - and Guiders were expected to be ready to instruct their Guides in all of these skills. In order to provide them with the support and assistance they required, in Counties across the UK, Instructors were soon recruited to teach specialist skills in their area. County Secretary - she keeps records of County meetings and deals with the correspondence arising. She manages the communications between the County and Commonwealth Headquarters. She issues registration forms and deals with the completed forms and maintains the registration records. She holds the stocks of restricted badges and issues them where appropriate. In the early years she wore a terracotta-coloured cockade in her hat, and an oval navy badge featuring crossed red pens. After 1968, this was replaced by a terracotta-coloured 'hat flash' worn on the side of the air-hostess had, and a ribbon 'tie' with two terracotta stripes. Insignia for the post ended in 1990. In the early years there were also appointments for Division Secretary (white cockade and oval badge with crossed white pens) and District Secretary (navy cockade with white stripes, and badge with white pens) and Brownie Secretary (badge with brown crossed pens) - but these were less common appointments., especially as telephones became more widespread. County Treasurer - he or she is in charge of all County funds, their recording and appropriate use, and ensuring the auditing of the accounts at appropriate intervals. They can (but need not) be members of Guiding. County Camp Adviser - She is responsible for the maintenance of camping standards in the County, which includes arranging and running the training sessions, arranging assessments, approving campsites, and managing the paperwork pertaining to outdoor residential events. Initially they wore green cockade and hat cords - post 1968 they wore a generic 'County Adviser' hat flash, which was navy with a vertical silver stripe, and a navy tie. In 1990, distinguishing marks for Advisers were done away with. County Holiday Adviser - she is responsible for the training and assessment of holiday qualifications, approving holiday premises, and managing the paperwork pertaining to indoor residential events. Instructor - in the early years of Guiding, Instructors could be appointed for any relevant subject - they wore a badge with the letter "I" on the left lapel of the uniform coat. County International Adviser - in more recent times, with international travel becoming more affordable, many Counties have found it useful to have a 'local expert' on organising Guide trips abroad, who can also help coordinate dealing with invitations to attend international camps and similar events around the UK and abroad. Examples of the County Adviser Cockade, and Hat flash, are shown below. So many keen young women joining up and wanting to be Guiders, so much demand from girls for new units - yet enthusiasm alone will only carry a young Guider so far. She also needs training in how to do some of the skills she is expected to teach, ideas, techniques, resources, instruction on how to plan and run activities - so Trainers soon became an essential part of Guiding . . . The first step in this process was the opening of an Officers Training School. First, in August 1915, there was an Officers Training Camp held near Boxmoor in Hertfordshire. By October of that year a Training School had been set up by Mrs Agatha Blyth, charging £9 for 3 months' live-in training consisting of six weeks in town and six weeks in the country. In April 1916 the 'East End Branch' of the Officers Training School opened. By the time of the first annual report of the Training School in November 1916, it had 142 members in 15 Patrols. However things seem to have become turbulent in late 1918 with a number of announcements in the "Gazette" - in July 1918 it was announced that Officers who gained Diplomas from the Officers Training School would wear a red ribbon round their hats with a brown OTS badge. In October 1918 Mrs Blyth resigned as GOTS Commandant, and the GOTS was closed down. That same month it was announced that a new Guiders Training School had been set up under Miss Maynard. Then in January 1919 it was announced that the existing Diploma would become the Distinction Diploma (and effectively downgrading it). Meantime a new award, called the Chief's Diploma (confusingly!) was to be instituted, to be in the personal gift of the Chief herself, to be awarded to Distinction Diploma holders whom she considered had done special work for the movement. During this time many classes for Leaders started to spring up around the UK, led by Diploma holders (often referred to as 'Dips'. Often premises were loaned or hired, but ideal premises for residential courses, allowing for indoor and outdoor work, were hard to come by, which led to a desire for 'a home of our own'. Then Guiding got an offer . . .Mrs Ann Archbold Sanderson offered to sell her house and estate in the New Forest. Support from Princess Mary enabled Guiding to buy the Foxlease estate for it's Training School, and it became known as Princess Mary House, Foxlease. It became a training base not just for Leaders from across the UK, but also from across the world. Trainings were a week long, initially run by the Guider in Charge, but soon by a team of Resedent Trainers. A Patrol structure was followed, with a regular schedule of Patrol Duties, practical trainings and model meetings. Soon after, in 1927, a training centre in the north of England, Waddow Hall, was opened to keep up with demand. They were followed by Netherurd in 1945, and Lorne and Broneirion in 1947. As all of these centres ran week-long residential trainings, there was a constant demand for trainers. But not just in the UK - as more countries adopted Guiding, so the demand for Trainers to travel abroad began. So from earliest days, qualified Trainers from the UK were traveling to countries abroad for extended visits, from a few months to sometimes a couple of years, travelling round a country training Leaders and Commissioners on all the practical skills, adapting them to local circumstances as they went. In 1945 a specialist "Homecraft Training School" was set up at Pax Hill, which har been the pre-war home of Robert and Olave Baden-Powell, before being requisitioned during WW2. There four-month courses for 14-17 year olds, covering cooking, household accounts, laundry, dressmaking, cleaning etc, were run by specialist trainers. It was in 1946 that the older schemes were replaced by the Training Certificate.